After our good experience as Via Tevere, we were still craving Neapolitan-style pizza. 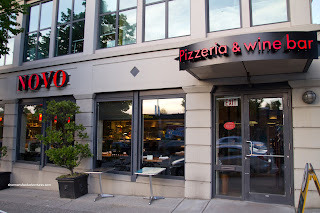 Seeing how there were not many left for me to try, we headed over to the former location of Incendio, which has now become Novo Pizzeria and Wine Bar. This time around, it was the softball team, not the hockey team (although Milhouse, Lionel Hutz and Bear are on both, just like me). With a fairly large group, it looked to be a good way to try many different items. Thank goodness too, if it were only myself and Mijune, we'd be trying the same amount of food for the both of us! Now, despite the absence of Mijune (who has joined us for meals before), I still did the "share food with more than one person routine" to get more variety. 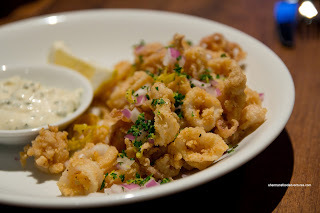 So I shared a Calamari with Chill first and it was pretty good. It was crisp on the outside and tender on the inside. The batter was a bit crumbly though. We particularly liked the gremolata on top as the lemon zest provided a nice bitterness. The dip was mild and slightly greasy. Dark Helmet (use the Schwartz!) 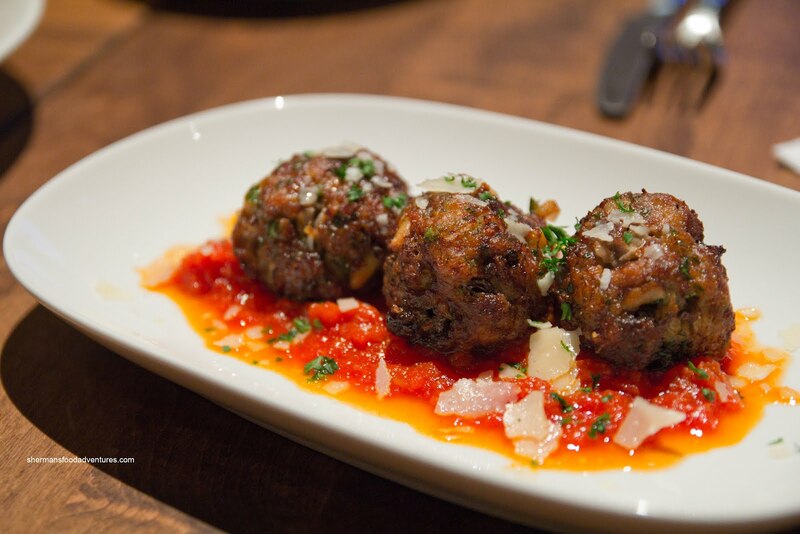 decided to try the Sicilian Meat Balls (hmmm... how ironic... "my Schwartz is bigger than your Schwartz!) consisting of currants, pine nuts, reggiano and marinara. The pine nuts were a nice addition to the moist meat balls. The meat was slightly loose and seasoned quite well (the cheese added another layer of saltiness). That and the full-bodied tomato sauce (with good freshness and zing) made for a flavourful dish. Milhouse, Boss Woman and Bear were nice enough to share several dishes with me starting with the Gnocchi, which were pan fried with warm sage butter. These were dense and doughy. I generally like it more dense, but these could've stood to be less so. However, the wonderful pan fry add a nice crisp texture while adding a smokiness/nuttiness from the butter. There was just enough sage for flavour without being too herby. 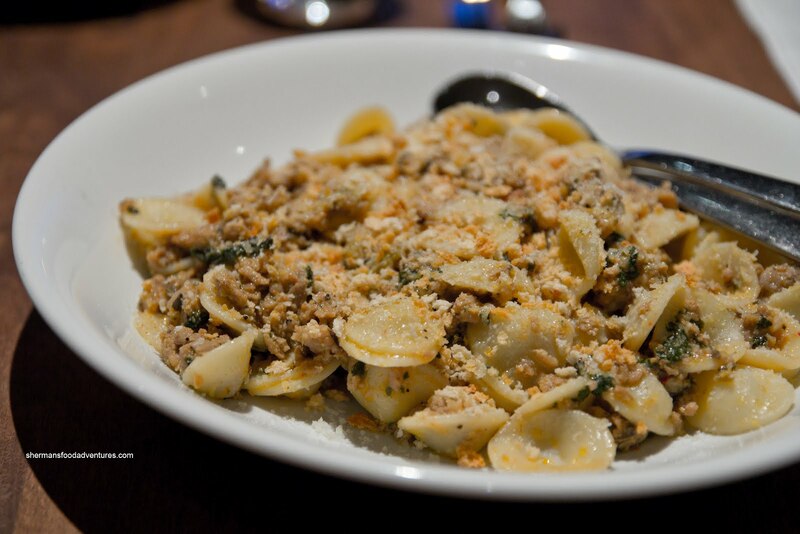 For our second pasta, we had the Sausage Orecchiette with Swiss chard, fennel pollen and toasted bread crumbs. The orecchiette was perfectly al dente and laced with plenty of meaty sausage. The fennel pollen really came through and complimented the sausage. There was some spice, which added another layer of flavour and welcomed crunch from the toasted bread crumbs. 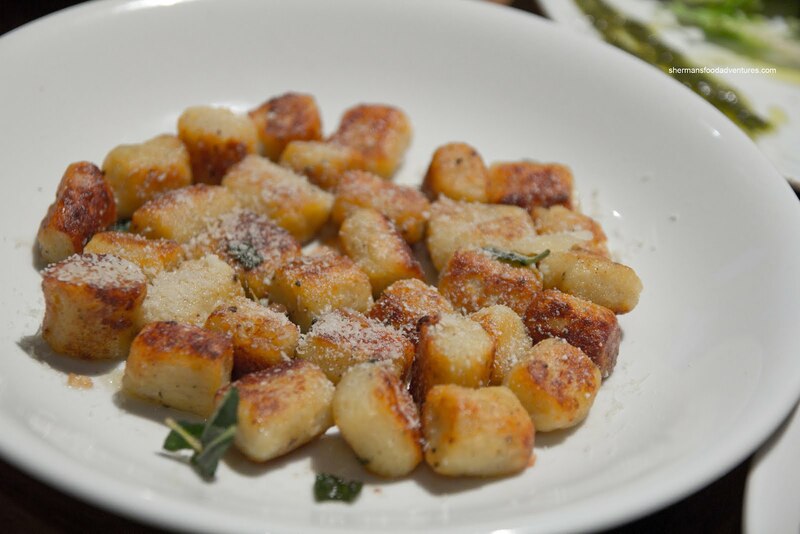 We liked this pasta a lot. 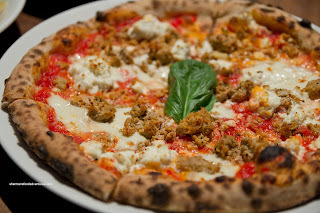 face (which meant it was a pizza... duh...) consisting of buffalo ricotta, Italian sausage, fiore di latte and marinara sauce. As the picture suggests, there was good leoparding which added a nuttiness to the crust. However, I felt the dough wasn't salted enough. Furthermore, the crust could've stood to be less soft (I realize that the middle should be soft, but the entire pizza was on the softer side). With that being said, the pizza itself was fine as a whole. In fact, the outer crust was chewy and smoky/nutty. 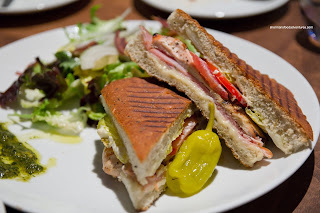 We also had the Prosciutto & Arugula pizza (not pictured) and it was pretty much the same except not as soft. It probably had something to do with the drier ingredients. 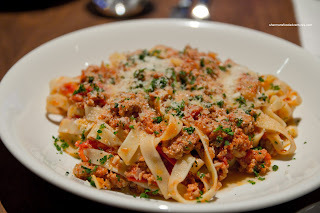 Bubbly ordered a pasta for herself being the Fettuccine Bolognese. This was a healthy portion with lots of slow-cooked moist meat. I found the pasta to be past al dente and quite soft. There was plenty of sweet onion hints in the bolognese, yet not much in the way of any tomatoness. Despite all of its shortcomings, it was not a bad plate of pasta. Chill went for something totally different from everyone else with the Grilled Chicken Focaccia. When I asked Chill about it, his response: "it is a chicken sandwich...". Yes, I saw that and no, that wasn't very descriptive. It sort of reminded me of our meal at Pied-a-Terre. I was able to squeeze more information out of him this time around. The chicken was moist will the other ingredients didn't wilt. The focaccia was grilled nicely being crisp on the outside while still soft on the inside. Ultimately, everyone left satisfied with their meals. Nothing was particularly outstanding, yet nothing was below-average either. Therefore, that would qualify as a decent restaurant experience overall.